Adrienne Rich was an award-winning poet, influential essayist, radical feminist, and major intellectual voice of her generation. Essential Essays gathers twenty-five of her most renowned essays into one volume, demonstrating the lasting brilliance of her voice, her prophetic vision, and her revolutionary views on social justice. Rich's essays unite the political, personal, and poetical like no other. Essential Essays is edited and includes an introduction by leading feminist scholar, literary critic, and poet Sandra M. Gilbert. 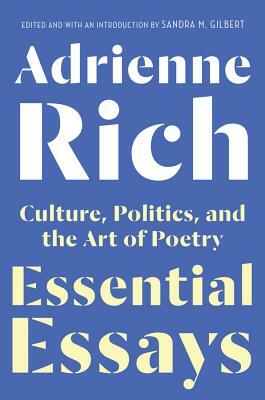 Emphasizing Rich's lifelong intellectual engagement, the essays selected here range from the 1960s to 2008. The volume contains one of Rich's earliest essays,"When We Dead Awaken: Writing as Re-Vision," which discusses the need for female self-definition, along with excerpts from her ambitious, ground-breaking Of Woman Born: Motherhood as Experience and Institution. As the New York Times wrote, Rich "brought the oppression of women and lesbians to the forefront of poetic discourse," as evidenced in her 1980 essay, "Compulsory Heterosexuality and Lesbian Existence." Also among these insightful and forward-thinking works are: "Split at the Root: An Essay on Jewish Identity"; excerpts from What Is Found There, about the need to reexamine the literary canon; "Why I Refused the National Medal for the Arts"; "Poetry and the Forgotten Future"; and other writings that profoundly shaped second-wave feminism, each balanced by Rich's signature blend of research, theory, and self-reflection.